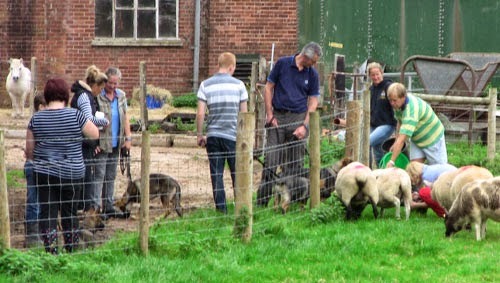 Today we all went down to Saundercroft farm near Broadclyst to introduce the pups to various livestock which included sheep, cows, chickens, horses and Jack the 16 year old pony released by Crealy park when he was 5 having nipped one too many children. The purpose of the day was to make sure all the pups are confident in the presence of livestock. The way we do this is by starting with the pups a short distance away from the animals and noting their reactions. If a pup shows any defensive aggression or fear we will move the pup to a distance it is comfortable with. Any assertive aggression which is not fear based we will correct the pup and then distract with titbits doing sit and down exercises. The pups also interact with each other and after a period of time we find the pups lose interest in the animals. The less confident pups become much more confident and the pushy assertive ones lose interest. Once we are happy the pups are confident with livestock we will later school them to pass through livestock such as sheep and cows and too ignore them. 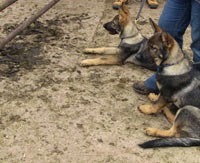 This is an ongoing process over a period of time and it is hoped the dog handler the puppy is eventually assigned too continues this training.. Police dogs are required to work in rural areas searching and tracking offenders and missing persons and so it is important that they are confident in the presence of livestock and know they should ignore them. Today I was joined by Ash, Annie, Axel, Ava and Argo who are all now nearly 16 weeks old and our newest recruit Grommit who is 12 weeks old. We started the session introducing the pups to the sheep in their enclosure. Annie, Axel, Grommit and Ash all relaxed in and around the sheep. In fact all of the pups were very sensible and neutral in the presence of the sheep. Next it was on to the cows in their enclosure. Argo and Ava in a very relaxed pose are looking at the cows. Grommit on the left having got under the gate. Next it was on to the horses in the stables. 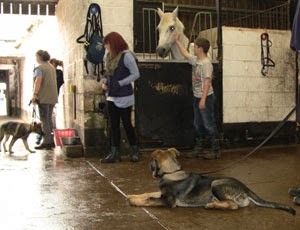 This could have been quite daunting for the young pups as the horses were looking out over their stable doors and the layout of the stables meant the pups were surrounded by horses. Axel above completely chilled out next to a very large horse. The star of the day Grommit going one better and licking all the horses completely unfazed. 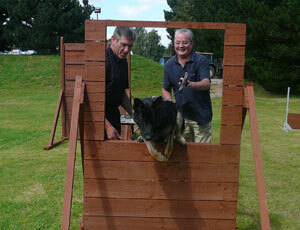 Next Grommit showed us his riding skills sitting in the trap being pulled by pony Jack and his owner Andi Darby. We all then took the opportunity to have a group photo with Jack. Finally we finished with my favourite the chickens. 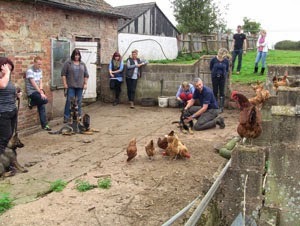 The chickens always tempt even the most well behaved dogs but as you can see from picture above the pups once again showed what a sensible well balanced group they are. I am especially grateful to Andi Darby’s mother Jean who owns Saundercroft farm and allowed us to use the farm while she is away on holiday. I am also grateful to Andi who is a serving Police dog handler at Newton Abbott. Andi was due to start duty after looking after us and Andi’s partner Simon who also helped out was due to start work at Exeter airport at 5pm where he works as a pilot. I was extremely proud of all of the pups today. 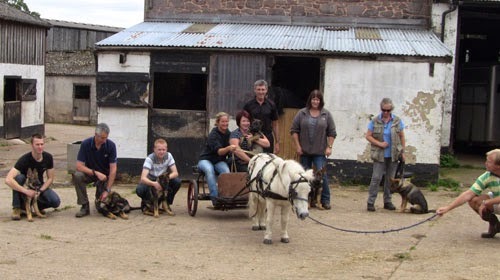 They were all very relaxed, confident and sensible with all of the animals and the day was enjoyed by all. I will end with a picture of Ash sitting up on the breeze blocks surveying the scene in a calm relaxed manner which summed up the day for me. 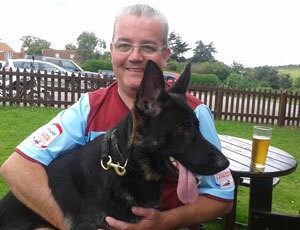 I am still in shock as are Cleo’s family Chris, Donna, Tom and Jake and our extended family of puppy walkers and police dog handlers at Cleo’s sudden death at the family home on Tuesday 4 September 2013 from a stomach torsion. Cleo had been mated to a stud dog 4 weeks previously and began showing signs of lethargy and general lack of energy after about 2 weeks. Such was the concern of the family she was taken to the vets on 3 occasions. She had no temperature and scans showed no obvious problems. It was assumed she was just having a difficult pregnancy. A post mortem showed evidence of a tumour developing behind the liver and the fluid caused by the pregnancy had restricted space for food intake which caused the torsion. She was carrying at least 7 pups. Cleo was one of 5 litter brothers and sisters bred in Wales of dutch breeding who I assessed and brought back to our force aged 8 weeks on the 26 of October 2011. Once I got them back at my house I noticed they were all suffering from an acute stomach upset which was confirmed as Coccidia a parasite which infects the small intestine. They remained with me for several weeks as I needed to stabilise them before they could be allocated to their new puppy walkers. For several weeks it was touch and go with both Nero and Archie having to be rushed to the vet and needing to go onto a drip to recover. 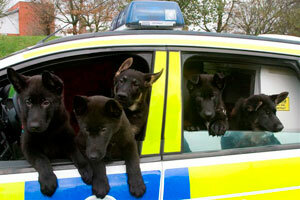 They are pictured here at 10 weeks of age with my colleagues on there way back to full fitness with Cleo in the middle. Her brothers were Regan, Archie, Nero and her sister Sally. Cleo was the out and out boss in the litter and was a big personality from the start. (pictured above). 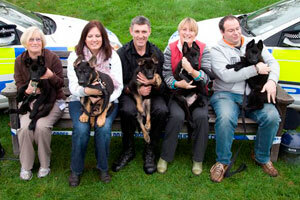 They are all pictured here at their first get together at 13 weeks of age when they had all fully recovered. pics 2.3,4. Cleo is on the right. I had realised from the start that Cleo was special and so I kept her with me for further evaluation. even at this early stage I wanted to use her as the foundation for our breeding programe. 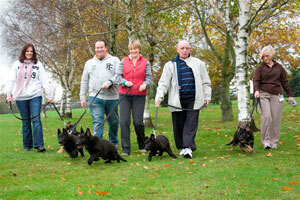 When she was 4 months old I allocated her to her new puppy walkers Chris and Donna Highton and their boys Tom and Jake. From the moment Cleo went to the family they did a brilliant job of socialising her and never missed a training session. 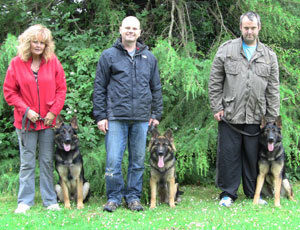 Shows the dutch litter at training from left to right Archie, Cleo with Chris, Donna and son Jake, Sally, Regan and Nero. 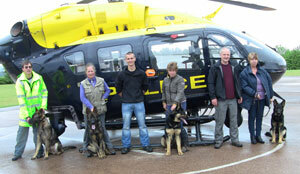 Archie and Sally are now operational police dogs in Devon and Cornwall. 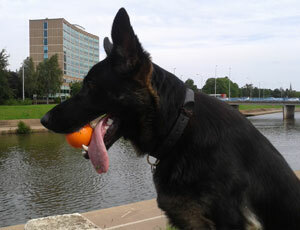 Nero is an operational police dog in Thames Valley. Regan is a border police patrol dog in America. 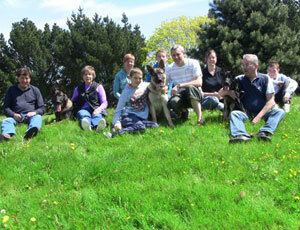 I have included 1 other group photo below showing how the scheme is very much a family affair. 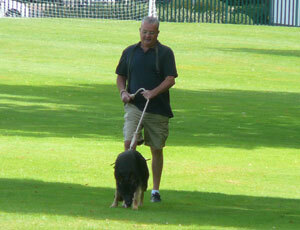 I have also included some photo’s of Cleo training with the love of her life Chris. Chris showing his superior fitness keeping up with Cleo who is tracking me down as I hide behind a tree out of view. 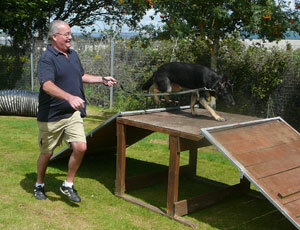 Cleo going over the ramp and the obvious pride and joy written all over Chris’s face. Going through the window jump. Cleo boldly going up and over the narrow walkway. Showing Cleo’s wonderful nature with young puppy Jack. I am not ashamed to admit I have shed a lot of tears writing this tribute. I am devastated at her loss but I take comfort in knowing that she adored her family Chris, Donna, Tom and Jake and couldn't possibly have been happier in the short time she was with them. I thought I would finish by demonstrating how Chris and Cleo used to maintain their incredible fitness with one of their many training sessions at their favourate fitness centre. I raise my glass to a special dog. Who knows Cleo maybe one day we will meet again and you will let me have my ball back first time without me having to negotiate with you. Rest in peace special one. 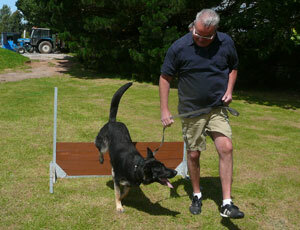 The assessments for the September 2013 initial police dog course are finally completed. The last few weeks have been taken up with assessing 9 of our dogs to see if they have the necessary abilities and potential to begin their Initial Police dog training on the up and coming Initial Police dog courses starting in September this year. We require 5 dogs for our handlers on that course starting on the 9th of September and the remaining successful dogs will be going to other Police forces to begin training as General Purpose Police dogs. 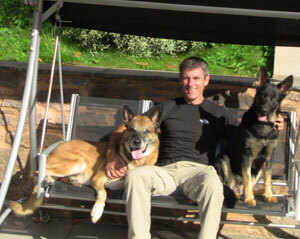 We wouldn’t normally have so many dogs but as we are not sure whether there will be a January 2014 course we have brought 3 of those dogs forward. The candidates were Shadow, Codi, Bear, Betty, Jasper, Megan, Max, Jack and Zeta. Picture 1 shows from left to right Shadow, Codi, Bear and Betty. All these dogs are 12 months old which is young to start an initial course. Codi, Bear and Betty are all litter mates. Picture 2 shows from left to right Jasper, Megan and Max are also litter mates from different breeding and are also 12 months old. 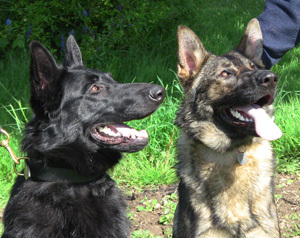 Picture 3 shows Jack and Zeta who are brother and sister and are 15 months old. 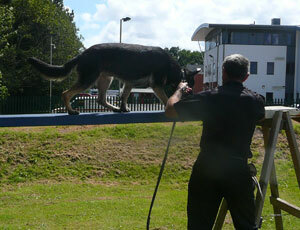 All the dogs were assessed on a wide range of skills and aptitudes to work. I have attached a sample of the various assessments undertaken. 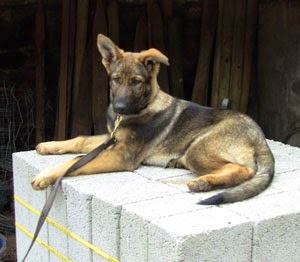 We are looking at their potential to Track (the ability to follow the scent of a person who has walked or run away and needs to be located), search for property or articles that have been discarded, boldness to deal with threatening situations, determination, tenacity, general all round confidence and trainability. All of the dogs assessed extremely well and once again showed the benefit of the work put in by the puppy walkers and the fortnightly training and development sessions they attended with their pups. 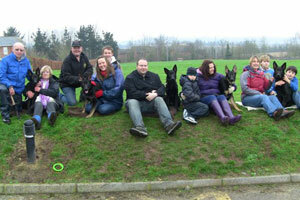 Shadow, Codi, Bear, Jasper, Megan, Max and Zeta passed all elements of the assessments. Jack unfortunately failed his courage test. For this test the dog is walked through a wooded area as if out on a general walk with me. The dogs all know me and are very relaxed walking with me. After we have walked for approximately half a mile and the dog is switched off, a man in a cape wearing a mask jumps out from behind a tree in front of the dog. We expect the dog to take avoiding action and skirt away from the figure and all dogs have varying distances that they will move away. We then expect the dog to respond to the threat by barking at the figure but we acknowledge they are still going to keep their distance. The person who jumps out then removes his cape and mask and I then walk over and engage in conversation with the person. We are looking for the dog to recover and go over to investigate the person. Unfortunately Jack turned tail and ran for nearly 100 metres which is a failure in itself and recovery was not ideal either. This surprised me as I have never seen Jack be frightened by anything from the time he was a tiny pup until this test. I have decided to give Jack more time and I will be evaluating further his boldness in the coming weeks. Betty was very bold on all of the boldness tests but she was lacking general determination on the searching exercises and play drive. I have a soft spot for Betty as when she came to us she was diagnosed as having a grade 2 heart murmur when she was a little pup. She stayed with me for her first few months while we arranged to have her examined by a heart specialist. He told us not to worry she would grow out of it and she has. She is currently staying with me again to do some further development work and she has improved so much with the one on one attention that she now looks an outstanding prospect. She is pictured here showing what a stressful life it is living with me and my old Police dog Spud. There are 4 new inexperienced handlers on our in force initial course and this had to be taken into account when allocating dogs as several dogs would be better in experienced hands. Megan, Max, Jasper, Shadow and Zeta have been allocated to handlers within our force. Codi has been allocated to PC Lee Briggs and Bear has been allocated to PC Brendan Trent both of Dorset Police and they will be attending their initial course in Surrey Regional Police dog school starting on the 16th of September. Hopefully Dorset and Surrey will take into account their young ages when taking them through their training. Its not exactly Wizard of OZ as Betty’s heart is now fine but Jack needs to discover some courage over the coming weeks and will hopefully go on to become a Police dog. I will keep you all updated on every ones progress over the months ahead.